The Takamine LTD-1997 was Bob's first departure from the traditional 'ring' rosette design (1997). This whiptail lizard was the last of the Santa Fe motifs used for the limited edition models. Inspired by the natural scenery of the southwest, this design paid homage to a common sight in the desert. For the talented luthiers at Takamine, this was a challenging model to manufacture. The design was laser-cut clear through the guitar top (instead of routed) to render the fine details of the lizard's fingers and tail. 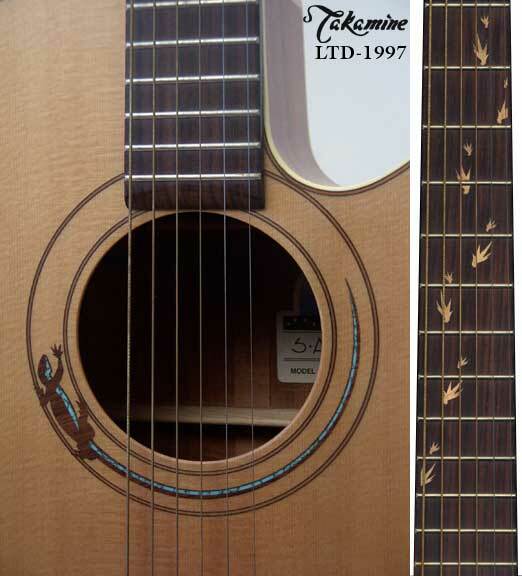 The fingerboard inlays depict the left behind footprints of the runaway lizard, crossing the neck diagonally. The lizard inlays consisted of single pieces of rosewood and turquoise.